Robert Venditti and Raphael Sandoval make one last appearance on “Hal and Pals” as this final issue rings in the end of an era. The galactic battle between the Green Lantern Corps and Darkstars comes to a head. Meanwhile, Hal Jordan faces Tomar-Tu in hopes of saving him from himself. After the New 52 Venditti truly hit his stride in this DC Rebirth initiative, having pumped out one amazing story after the next, and his final issue is yet another love letter to the Corps and fans alike. Another legend in a long line of masters, Sandoval has proven time and time again why he was picked to helm the pencil works and how he became the quintessential artist for the series. Bringing character off of the pages with his stylized pencils is par for the course with Sandoval. His use of the double page splashes in the extravagant space battles adds to the grandiose nature of the series. Ending the series while bringing focus back primarily on Hal, just as it began, becoming pure Willpower once again and bringing new life back into the Corps as a swarm of new Lantern rings fly across Sector 2814. Tomeu Morey takes Sandoval’s pencils to such great heights through his definition and wide array of vibrant colors important to the series. 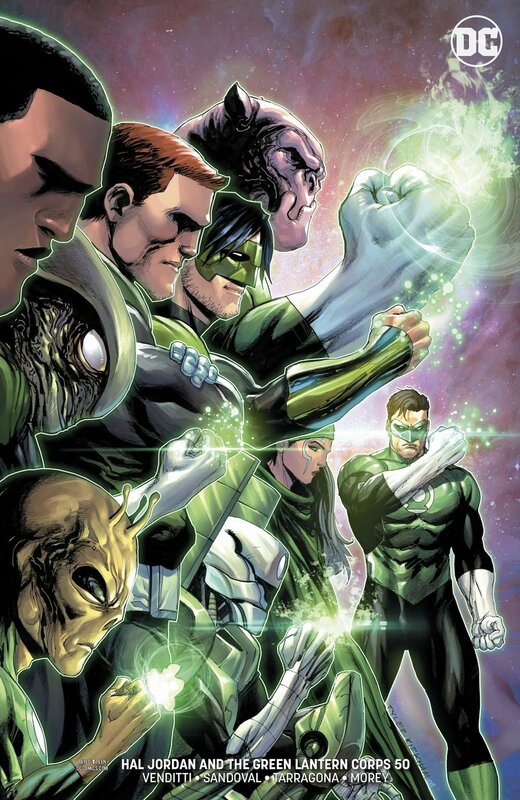 Legendary Green Lantern artist Tyler Kirkham puts out one last beautiful variant cover for the series, displaying Hal and Pals in all of their glory. These are sure to be missed as readers await Kirkham’s next project announcement. Hal Jordan stands as the greatest Green Lantern of all time, and this issue perfectly displays why he is the undisputed best of his kind. Venditti’s overabundance of love and care for the title is apparent from the first issue of the series down to the last. With the grand showdown between the Corps and Darkstars coming to an end, Venditti and Sandoval make certain to jam pack plenty of surprises and bittersweet moments into this issue. The past couple years on this series with Venditti at the helm, after the departure of legendary writer Geoff Johns, truly brought this series back into readers pulls and discussions with this heartwarming space opera. Venditti and Sandoval will go down as yet another legendary team in the Green Lantern mythos, delivering fan-favorite stories for years to come.